Postdoc Kyler Kuehn (HEP) recently hopped on a plane for Washington, D.C. and attended the 5thInternational Canada-American-Mexico (CAM) Physics Conference. The conference, which is held every other year, is organized by and for graduate students from Canada, the United States and Mexico. The gathering promotes networking and research collaboration among early career scientists. Research is shared in various physics disciplines such as astrophysics, biophysics, condensed matter physics, materials science and particle physics. Kyler has remained involved with the conference since he was the chair of the Graduate Student Organizing Committee in 2005. In addition to advising the CAM 2011 Committee on organizational issues, he also secured support for the conference from Argonne’s Educational Programs. Kyler gave a presentation on his research at the conference on the Dark Energy Survey (DES), an astronomical survey, which involves the Astrophysics Group within the High Energy Physics Division. He shared the latest details of his research and the survey which will begin in 2012. This landmark survey will observe one-fourth of the southern sky to determine the properties of distant galaxies and supernovae. The survey is an effort to constrain the nature of dark energy, which is theorized to be the cause of the accelerating expansion of the universe. 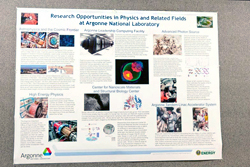 Kyler also presented a poster highlighting the many research opportunities at Argonne that would be available to the conference attendees upon completion of their Ph.D. He gave a short presentation on the history of Argonne and the current state of the laboratory’s Postdoctoral Program. The attendees also heard about the Postdoctoral Society of Argonne, the new Postdoctoral Mentoring Program, the recent Postdoctoral Research Symposium and the many fellowships available to incoming postdocs. The conference featured plenary speakers from the three host countries and contributed talks and posters from approximately 100 student attendees. There were special panel discussions on the role of science in international diplomacy and public policy as well. Several physicists from the D.C. area involved in public service shared highlights from careers spent bridging the gap between scientists and politicians in the international community. The conference culminated in a banquet held in the Longworth Congressional Office Building. The next CAM Conference will be held in Canada in 2013. For more information on CAM2011, visit the official Web site at http://cam2011.princeton.edu/ or search for “CAM2011” on Facebook. 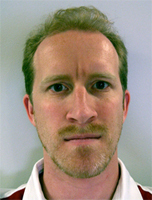 Kyler Kuehn (HEP) is a postdoc in the Astrophysics Group within the High Energy Physics Division. He works with Steve Kuhlmann (HEP), physicist, and other members of the Dark Energy Survey Collaboration. Kyler and his colleagues recently built a scaled-down version of the 570 Megapixel Dark Energy Camera, which was used for testing and preliminary observations prior to the start of the Dark Energy Survey. Kyler aspires to a university faculty position, where he will continue his work on stellar observations and astrophysical transient science with the Dark Energy Survey. This entry was posted in Communicating Science and tagged HEP, kyler kuehn. Bookmark the permalink.